A howitzer is normally a comparatively short cannon with a medium muzzle velocity and a curved trajectory. The higher angle of fire, often referred to as indirect fire, allows the weapon to reach targets hidden from flat trajectory (direct fire) guns. Howitzers are generally employed to fire high-explosive (HE) projectiles and not armor-piercing (AP) projectiles. For antitank purposes, howitzers can fire a shaped-charge projectile, consisting of an explosive charge with a lined hollow cone at the nose end, which develops a high-velocity jet upon detonation. Unlike an armor-piercing projectile that punches a hole through armor plate, a shaped-charge projectile instead burns a hole through armor plate. A mortar is a cannon with a short barrel, usually smooth bore, and a low muzzle velocity. It is fired at high elevation and has a higher angle of fire and shorter range than a howitzer. It is used to reach nearby targets that are protected or concealed by intervening hills or other short-range barriers. The term gun generally applies to all firearms, but in its more restricted and technical sense, it refers to a cannon with a relatively long barrel, fired from a carriage or mount. Compared to a howitzer, a gun normally has a longer barrel, a flat trajectory, and a more limited maximum elevation (except antiaircraft guns). It is used either for long-range fire, or in the case of tanks, for the delivery of fire requiring a flat trajectory and high velocity. Tank guns can fire both armor-piercing and high-explosive projectiles. Most armor-piercing projectiles contain high-explosive elements within them. (2.92 inches) does not mean it will have the same performance characteristics as other 75-mm guns. The performance parameter of a 75-mm gun on a late-war German tank was far superior to a similar-caliber weapon mounted on an earlier-war tank. More important when determining the effectiveness of a tank gun are its design, the materials used in building it, how it was built, the type of ammunition used, how long the barrel is, and what type of fire control system is used to aim and fire it at targets. Within the German army during World War II there was a constant effort to improve the performance of tank guns, resulting in numerous variations of a basic design. For example, there were at least several progressively improved versions of the famous 88-mm gun in service with the German army during World War II. In general, the best way to improve the performance of a particular tank gun is to increase its muzzle velocity (how fast a projectile leaves the barrel of a tank gun). The higher the muzzle velocity, the faster and harder the projectile will strike its intended target. Muzzle velocity can be improved in different ways, such as lightening a projectile or adding a more powerful propellant (powder). A very common World War II method of improving muzzle velocity was to lengthen the barrel of a tank gun. For example, the 75-mm gun on the famous German Panther tank was 19 feet 2 1/4 inches long and could fire an armor-piercing projectile at a muzzle velocity of 3,675 feet per second. In comparison, the 75-mm gun mounted on the American M-4 Sherman tank was just over 7 feet long and fired an armor-piercing projectile at less than 2,030 feet per second. The importance of rapidly fielding a large quantity of Panther tanks was so great, that Daimler-Benz, Henschel, and other German companies soon started producing Panthers. The three basic production versions of the Panther were labeled (for some reason out of sequence) Ausf D, A, and G. By the end of the war in Europe, German industry managed to build an astounding 5,508 Panther tanks. The most common model was the Ausf G, of which 3,740 were fielded before the war ended. As with other German tank, the chassis of the Panther supported a variety of different missions. Variants using the Panther chassis included an armored recovery vehicle and a command vehicle. 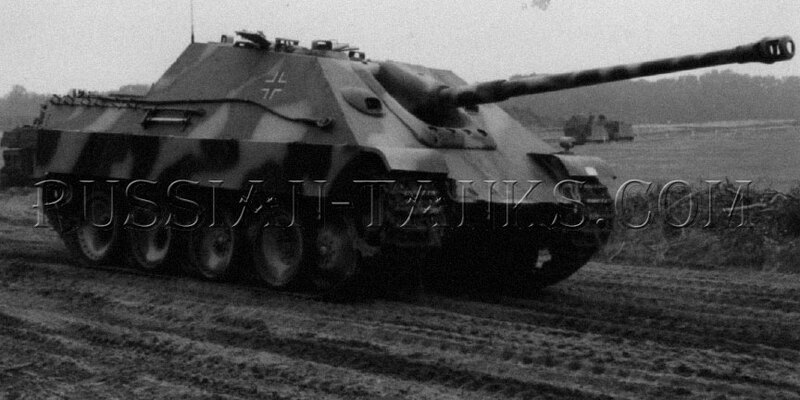 The armored recovery version of the Panther, known as the Bergepanther, had no turret. Rather, the fighting compartment of the vehicle was enclosed by an open-topped box-like structure 32 inches high, 8 feet 1 inch wide, and 7 feet 6 inches long. The only armament on the Bergepanther were two 7.92-mm machine guns. 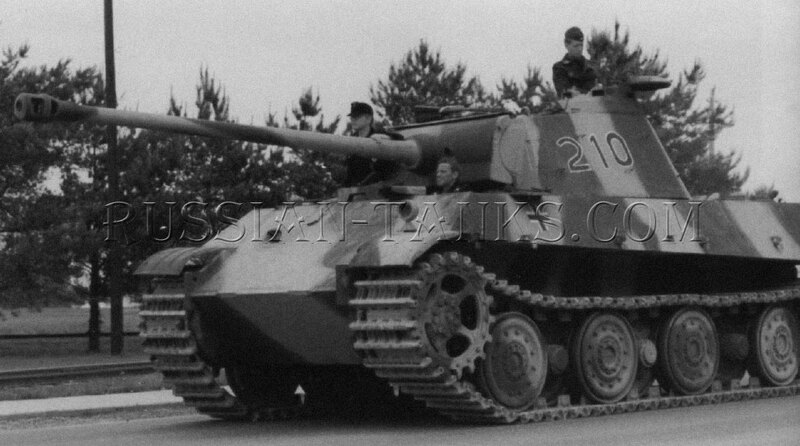 By the time the war ended, German industry had built 347 examples of the armored recovery version of the Panther. The command vehicle variant based on a modified Panther tank retained both its turret and main gun. To make room for the additional radios and associated generator in the vehicle, the number of main gun rounds was reduced to 64. German industry would build a total of 329 Panther tank command vehicles between late 1944 and early 1945. 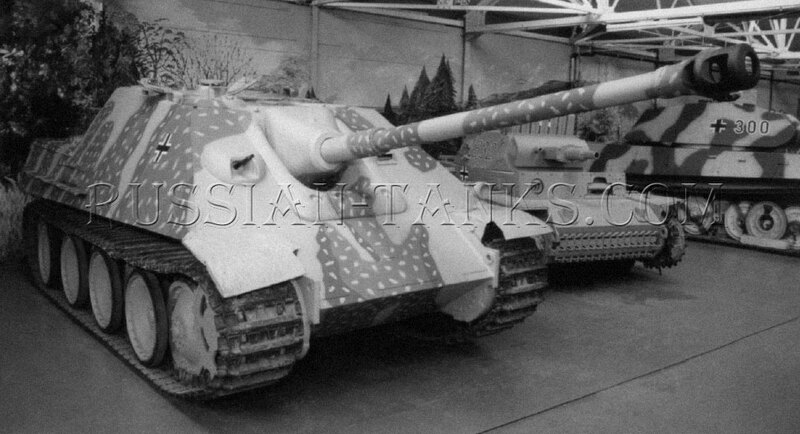 Starting in February 1944 the Germans began production of a new Jagdpanzer known as the Jagdpanther (Hunting Panther) based on the Ausf G version of the Panther chassis. The vehicle was armed with a limited-traverse 88-mm gun and a single hull-mounted 7.92-mm machine gun. German industry built 392 of these vehicles between January 1944 and March 1945. One of the latest German tanks SP [self-propelled] equipments to appear in action on any front, is an 8.8 cm Рак [antitank] 43 gun on a Panther chassis. The equipment consists of a recent type of normal Panther chassis, with a superimposed superstructure consisting virtually of a Panther glacis [front hull] plate and superstructure sides continued upwards to form a spacious fighting compartment with a roof and sloping rear plate. A German document states that the equipment is designed for engaging important targets at long ranges from stationary positions, and that it should not be used in support of infantry or as an 'assault' gun. It adds that unarmored targets must invariably be engaged with HE [high explosive] ammunition, which constitutes half the total ammunition carried. A noticeable feature of the equipment is the amount of room available in the fighting compartment to enable the gun to be easily serviced, and the fact that all the elaborate observation facilities available are on the superstructure roof plate, there being no vision openings at the front or sides of the vehicle except for the driver's episcope [periscope] opening. An unusual one-of-a-kind Panther tank variant generally called the Panther II is on display at the famous Patton Museum of Cavalry and Armor. It represents a 1943 German attempt to create a hybrid vehicle that would combine components from early Panther tanks with yet-to-be-built Tiger II heavy tanks. Armor design improvements to later production models of the Panther tank, and delays in the production of the Tiger II heavy tank killed the project. Only one experimental prototype of the Panther II was built before Germany surrendered. It was discovered by American troops at the end of World War II and shipped to Aberdeen Proving Ground, Maryland, for technical evaluation. Eventually the vehicle was traded to the Patton Museum where it now resides on display.